He’s an extremist, Reggie. For all we know, he walked all the way back to Riverdale from Canada. Reggie: I’m not down with it, Ronnie. Archie taking off like that. It’s not cool. Veronica: He’s an extremist, Reggie. For all we know, he walked all the way back to Riverdale from Canada. And right into the pressure cooker of school and the SATs. Reggie: All I’m saying is the Archie I saw last night was ... he’s different. Veronica: And I don’t disagree. He is different, Reggie. Reggie: And if it’s permanent? And he’s not your “Archiekins” anymore? Veronica: Look, I know what you want me to say, but I just can’t even think about that right now. 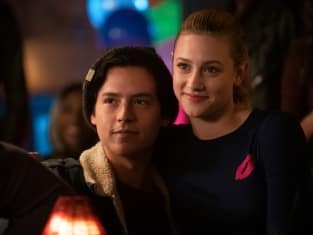 Riverdale Season 3 Episode 10: "Chapter Forty-Five: The Stranger"
Riverdale Round Table: Who Shot Hiram Lodge? FP: “Sheriff Jones” now, boy. Listen up! You’re looking at the new law in Riverdale. Permalink: “Sheriff Jones” now, boy.